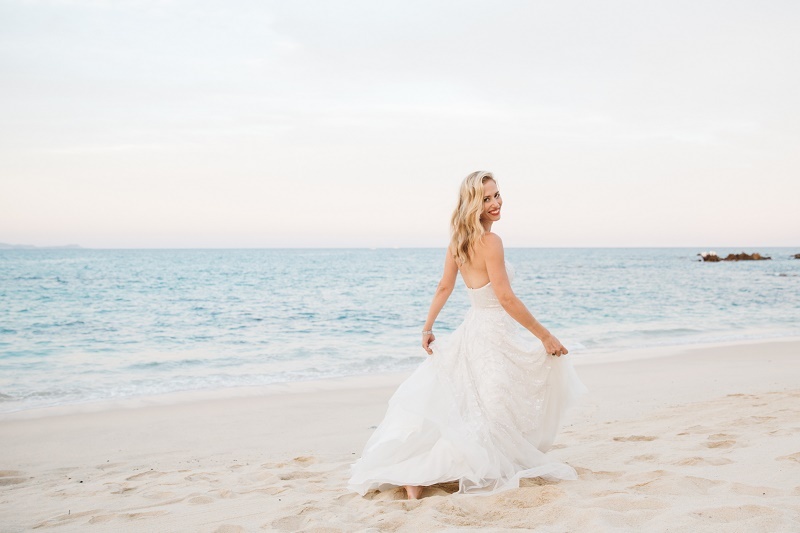 FOR OVER A DECADE NOW Elena and I have been working with brides and grooms from all over the world who have chosen to celebrate their weddings on the beautiful, sunny shores of Mexico. 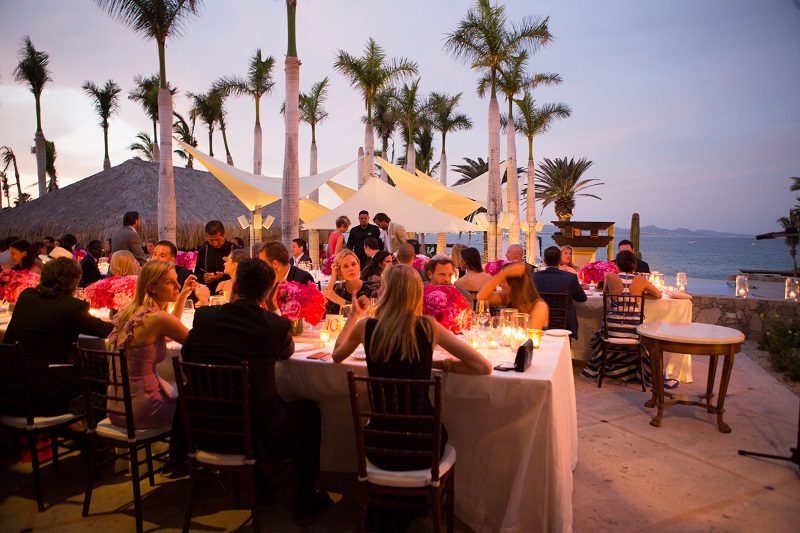 We consider ourselves to be extremely blessed to not only help create these milestone events in our clients’ lives, but to also have the opportunity to do so while sharing with them our love for Mexico. It’s a win-win from every possible angle! IT WAS A CELEBRATION OF LOVE ON THE BEACH for Lauren and Chris, who hail from Canada and Australia, respectively. 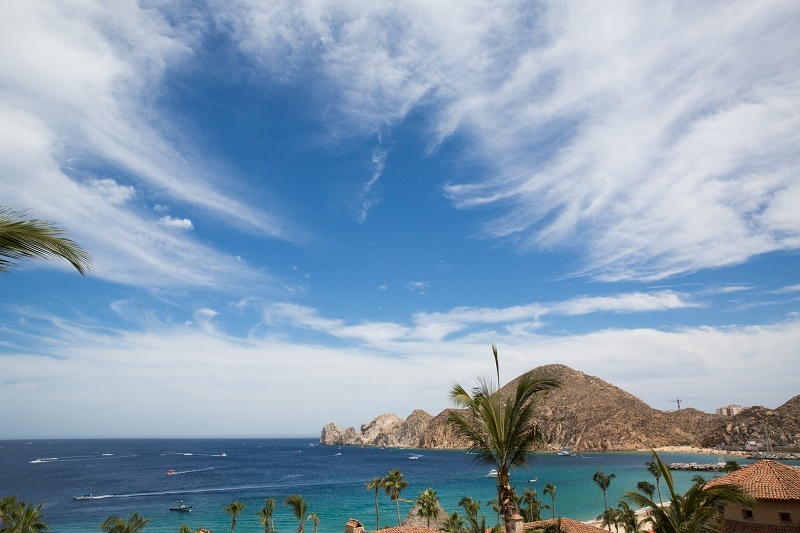 They chose the scenic beaches and luxurious resort area of our very own Los Cabos, Baja California Sur for their destination wedding weekend. 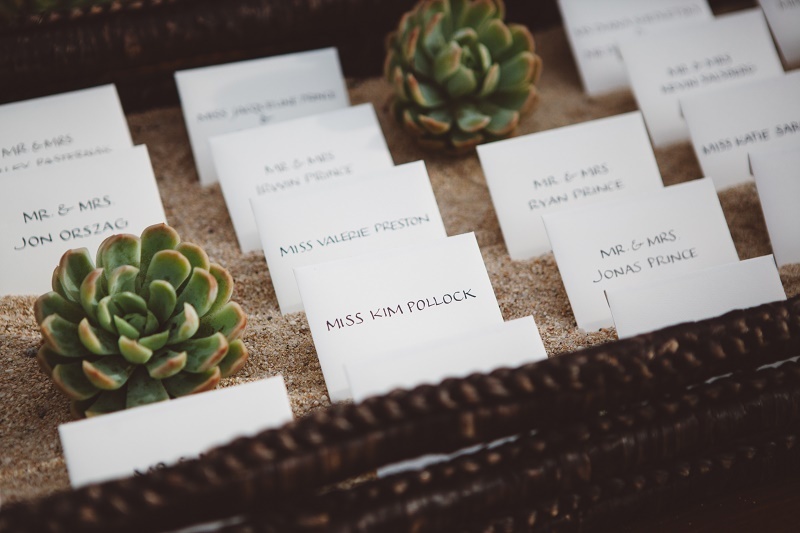 As a guest, it’s just not possible to pass up this kind of tantalizing invitation to enjoy a little beach vacation AND share in the bridal couple’s bliss, all at once. Lauren and Chris’ guests flew in for the party from as far away as Australia, Canada, and England; and as close by as New York City and Los Angeles. 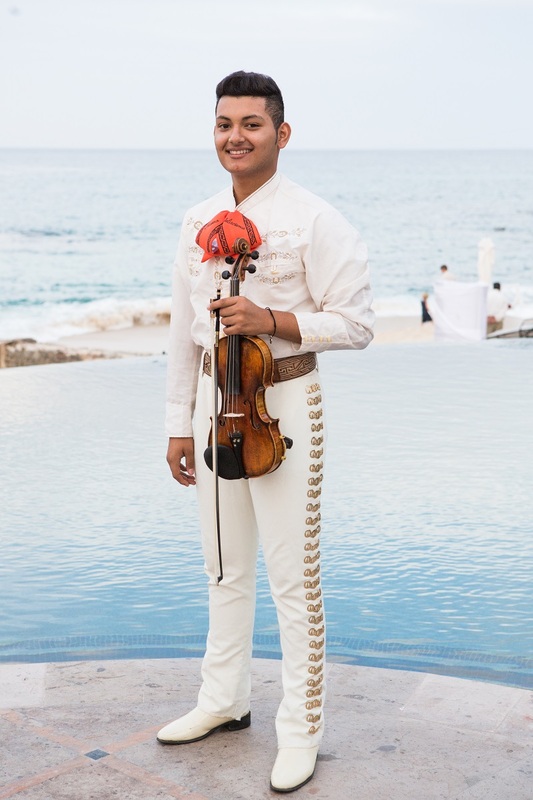 The Elena Damy Planning Team, led by the lovely Claudia Morales, helped the happy couple plan an incredible wedding experience that included a Welcome to Cabo! 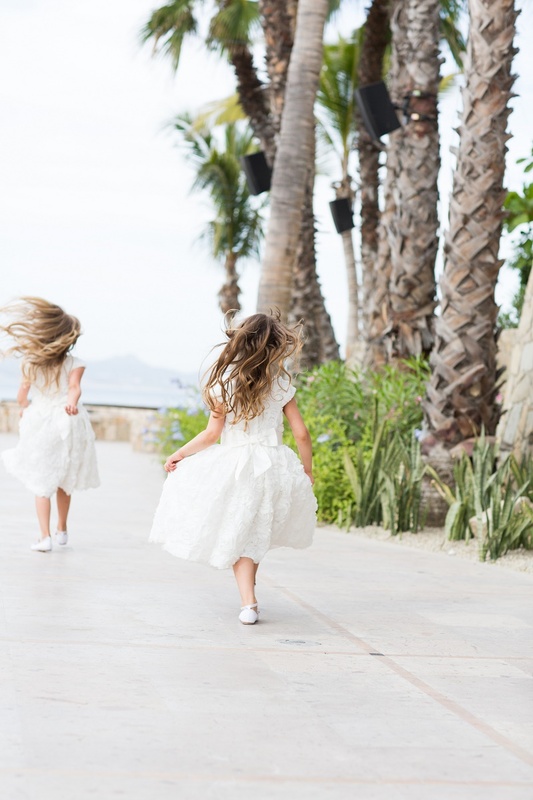 Pool Party at a private villa on the beach; a Rehearsal Dinner at Los Tres Gallos, an authentic Mexican restaurant located in Old Town Cabo San Lucas; a wedding ceremony on the beach and dinner dance reception at Club Ninety Six; as well as a Farewell Brunch on the beach at Hacienda Cocina and Cantina on the morning after the wedding. Claudia did a fantastic job and we couldn’t be prouder to have her on our planning team. 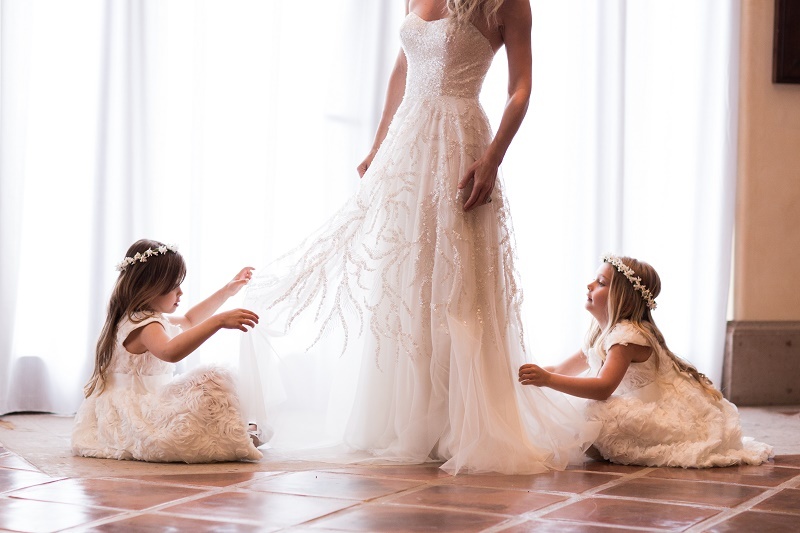 With so much to organize and coordinate, Claudia didn’t miss one detail, nor was one thoughtful moment overlooked. BRAVO CLAUDIA! FLORAL FOCUS. 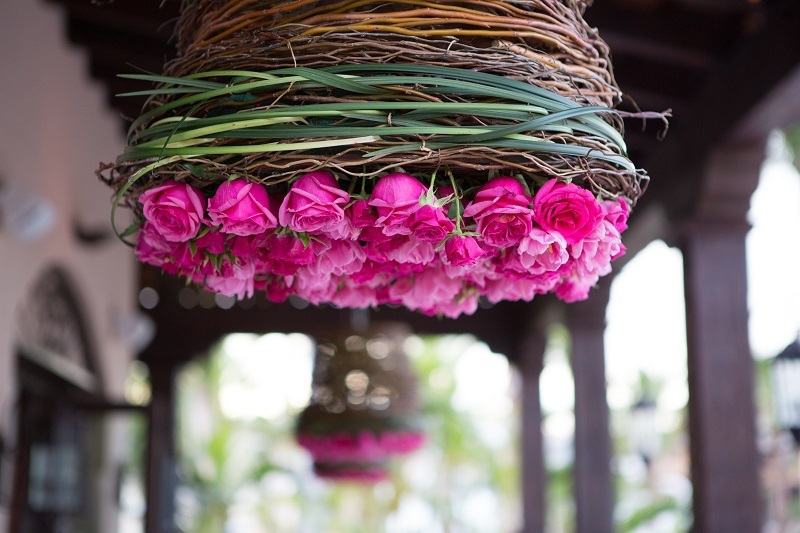 The wedding flowers and over all event design focused on bright, happy pink married with crisp white. 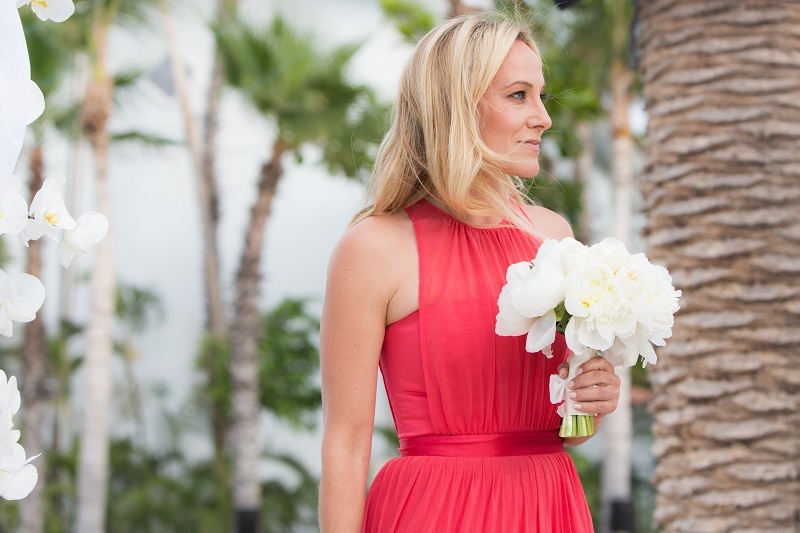 The personal flowers for the bridal party were monochromatic in tone, with all pink Peonies for the bride and soft white Peonies for the maid of honor. 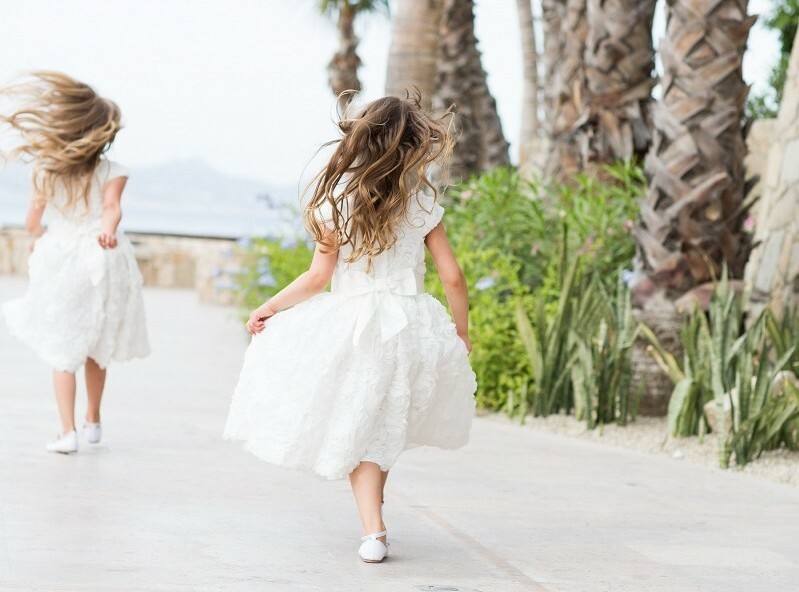 The couple’s free-spirited nieces served as flower girls and we just loved their pretty white dresses paired with their natural beach-wavy long hair! 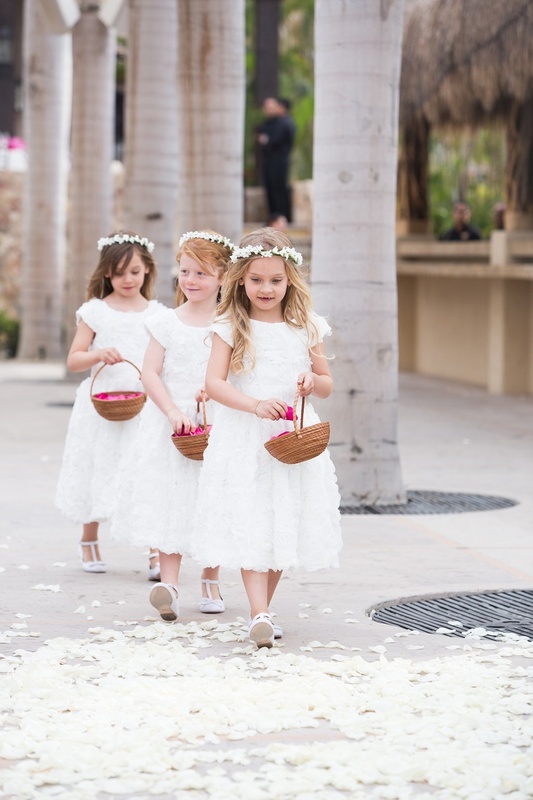 Keeping things light and airy, Elena designed floral wreaths with hand-strung white Hyacinth blooms, and each young lady carried simple woven baskets filled with hot pink rose petals. 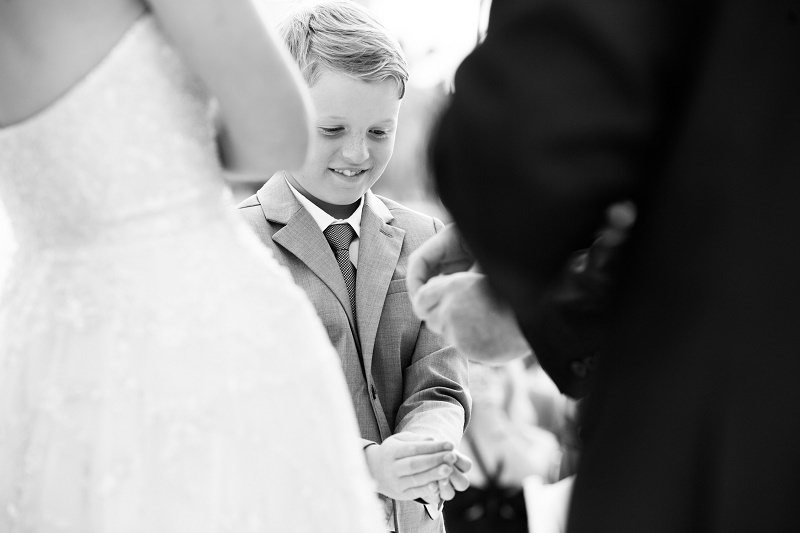 The groom, best man and father all wore elegant boutonnieres of petite Hyacinth blossoms. WE DESIGNED A JEWISH WEDDING CANOPY using a distressed wood stage riser, an extra wide aisle covered in fragrant white rose petals and flower heads, and a floral Chuppah. 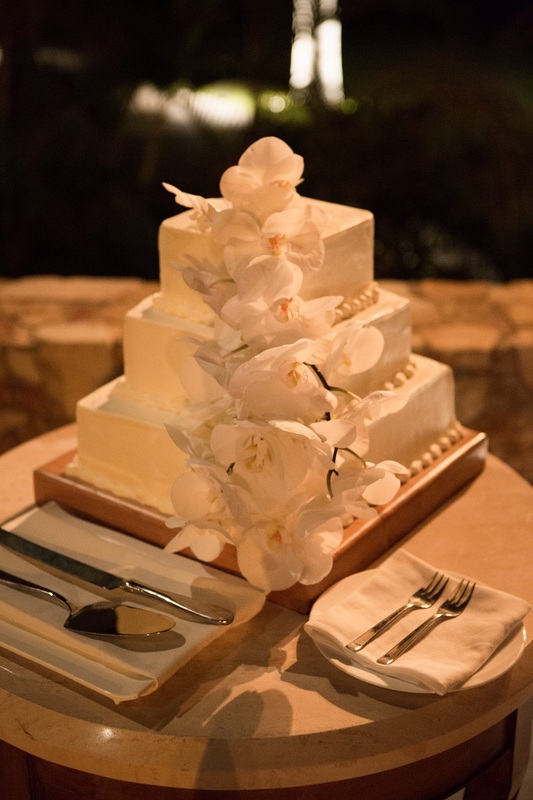 We covered the Chuppah from top to bottom in white Phalaenopsis Orchids and softly billowing white fabric for the oceanfront wedding ceremony. 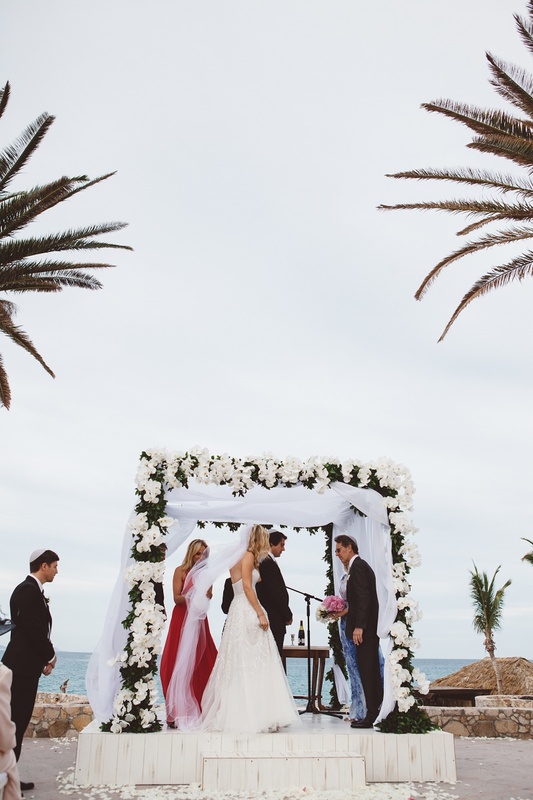 Only the blue waves served as the official backdrop to the stunning setting. PARTY TIME ON THE TERRACES AT CLUB NINETY SIX! 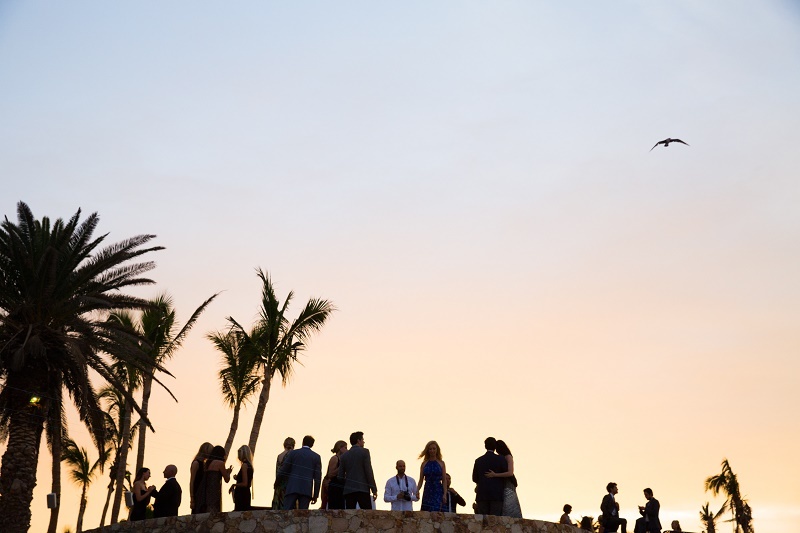 After the wedding ceremony, guests enjoyed delicious cocktails and hors d’oeuvres on the terraces while Lauren and Chris took photographs around the beach club. 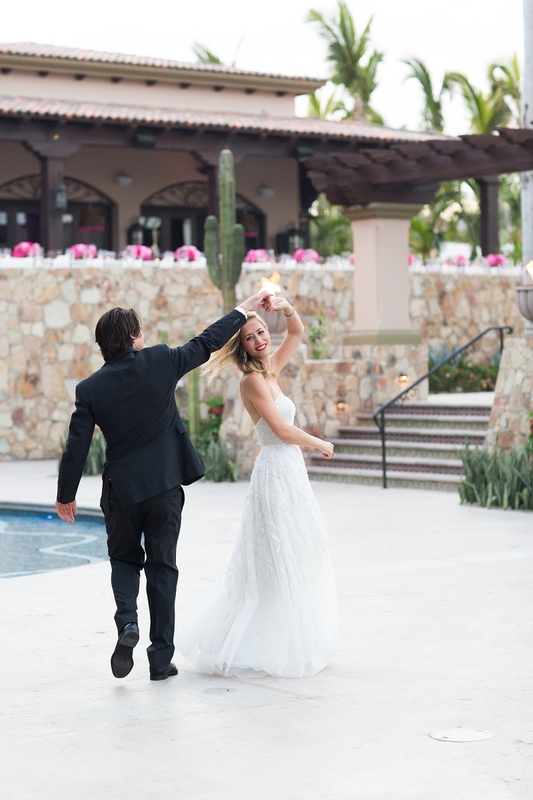 This candid photo (below) of the bride and groom dancing next to the infinity pool just below the dinner area, with the row of pink centerpieces seen in the background, is one of our favorites! Oh so lovely! 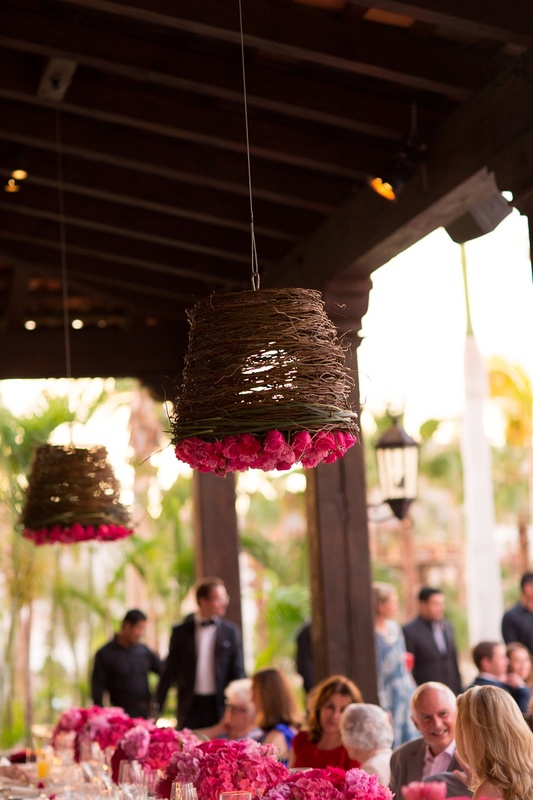 You can see how important color is when planning your wedding, but placement and setting is what seals the deal. 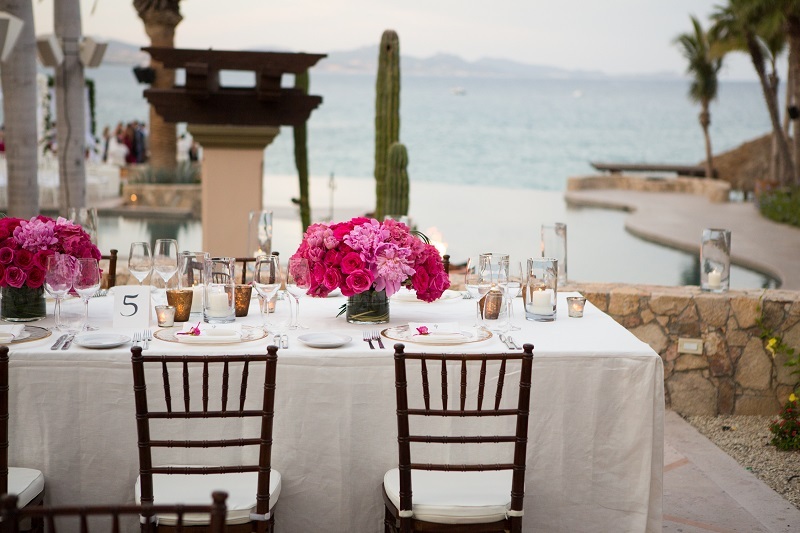 Certainly, at this amazing Los Cabos wedding venue, every table enjoyed a gorgeous, unimpeded view no matter which way they looked! 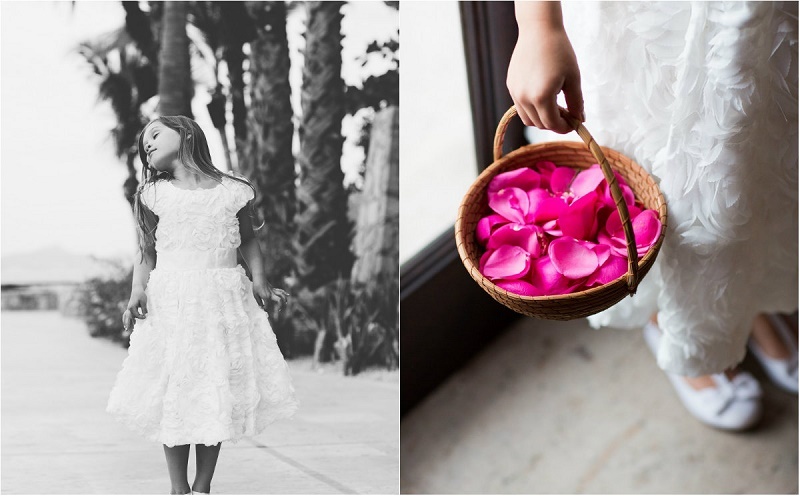 ALL ABOUT THE PINK! 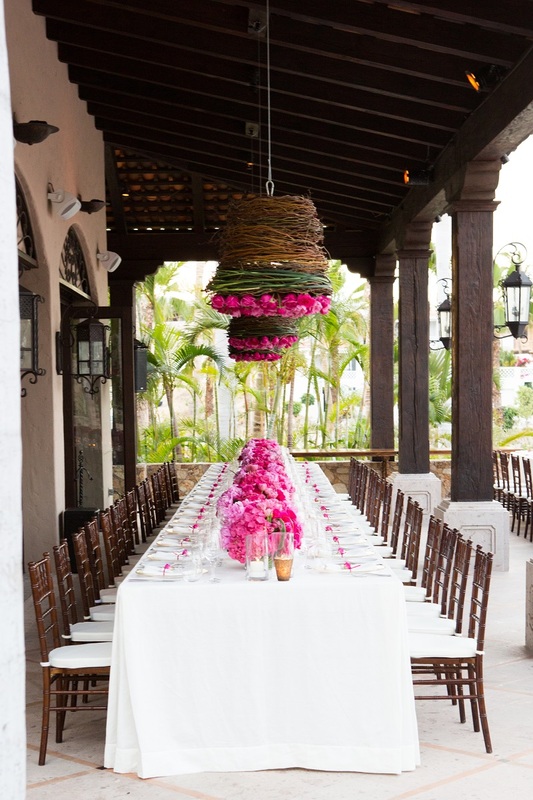 Our custom-designed floral lamps brought a vibrant warmth to the long, feast-style dinner tables. 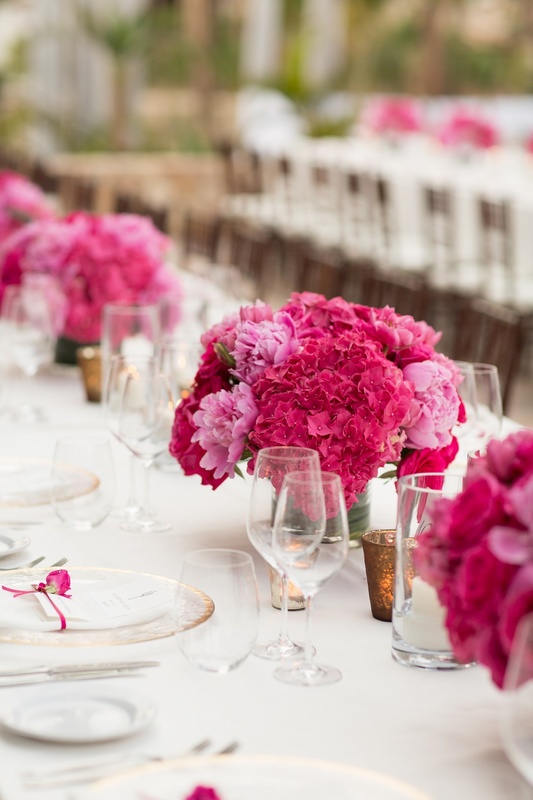 Soft white, floor-length linens paired with dark wood dinner chairs for an elegant canvas for our lush hot pink centerpieces. 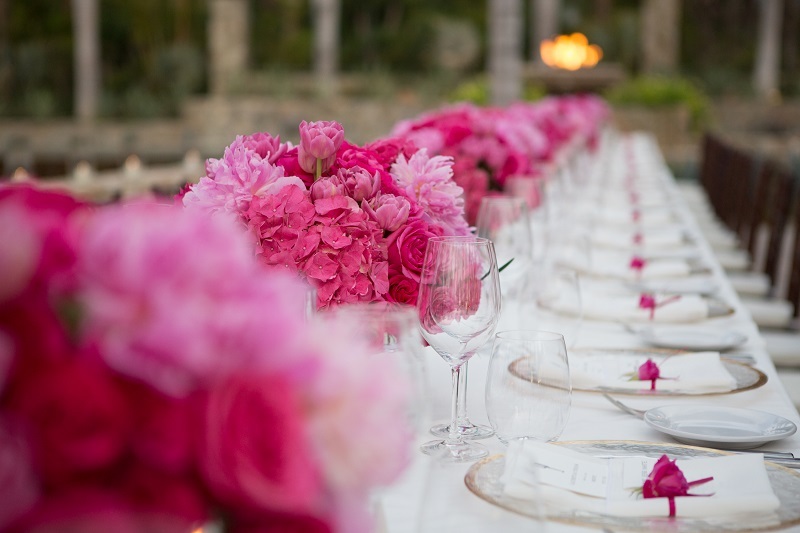 Elena designed the low centerpieces with a mixture of hot pink Roses, candy pink Peonies, bright pink mophead Hydrangea, and true pink double-Tulips. Clear modern glass hurricanes with white pillar candles added a soft glow as the sunset in the dinner area. 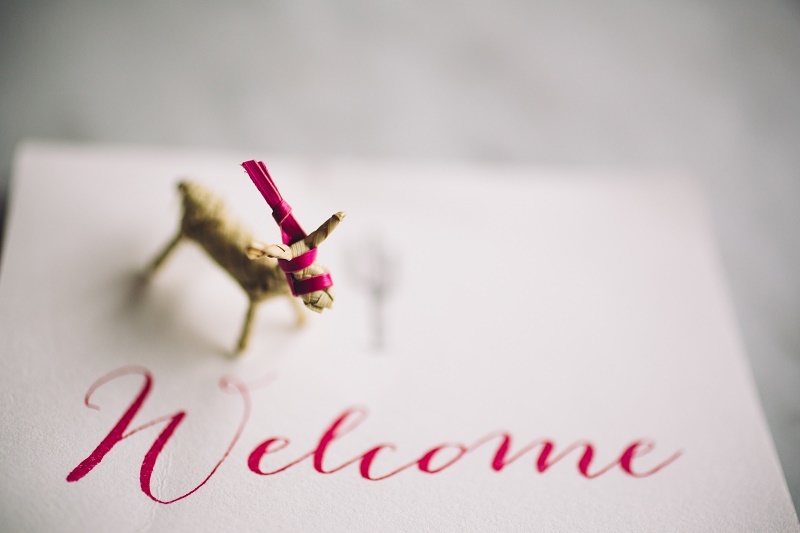 Gold-rimmed glass chargers, low amber glass votives, clear stemware, and flat folded napkins with hot pink ribbons and dainty rose heads completed the classic tablesettings. 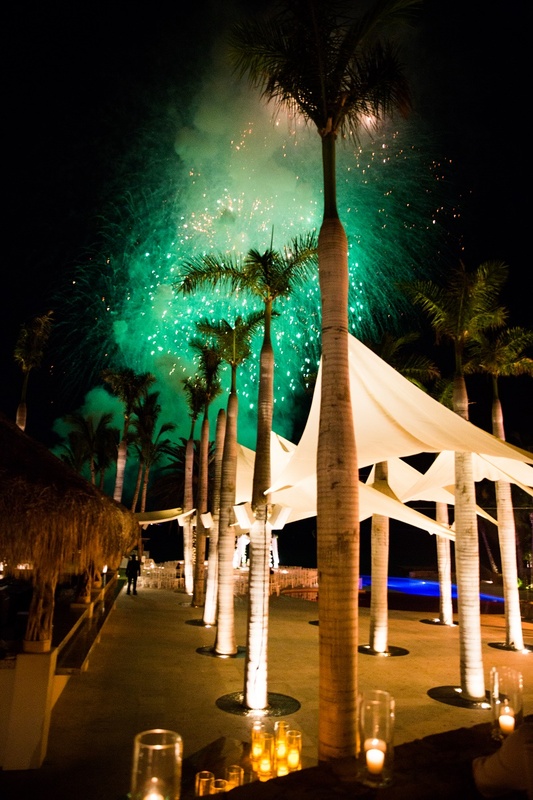 Love on the Beach at Club 96, Los Cabos, Baja California Sur.